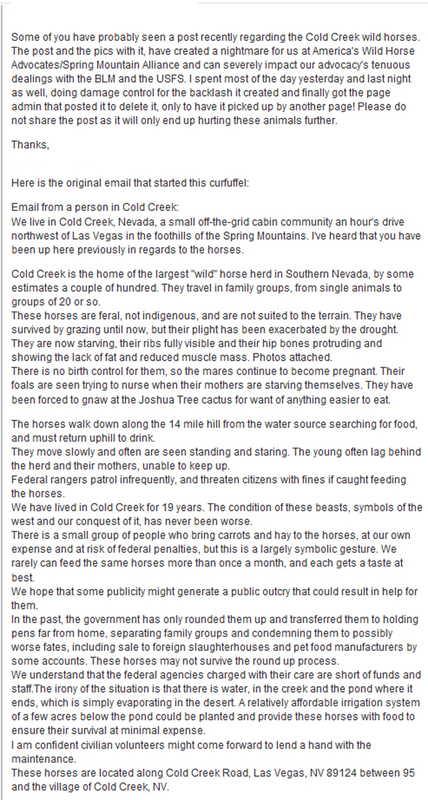 Who Will Stand For The Cold Creek Wild Horses? 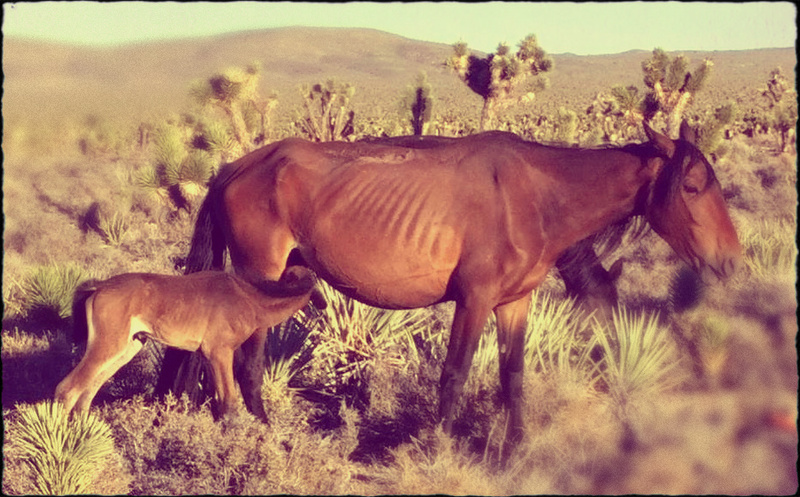 The Nevada Legislature is trying to exclude wild horses and burros from the definition of wildlife. That will allow them to also exclude wild horses and burros from water rights. There’s an old saying, “It’s better to help a friend a week too early rather than a day too late.” There are different variations on that theme, and I’ve most often seen it used when people are trying to determine when to euthanize a beloved pet. But a few days ago I was reminded of it in the context of the Cold Creek wild horses in Nevada, where at least some of the group are starving, including mares and foals. An ensuing debate (whether to help the horses or take no action) raises some ethical and philosophical issues about our idyllic view of nature free from human (and BLM) interference. For instance, is it acceptable to feed these wild horses on compassionate and moral grounds, or do we prefer a laissez-faire management policy that would subject horses and burros to starvation by letting Mother Nature work her will? You can see from the pics that the worst of these horses would probably rate a 1 or a 2 on the Henneke scale. 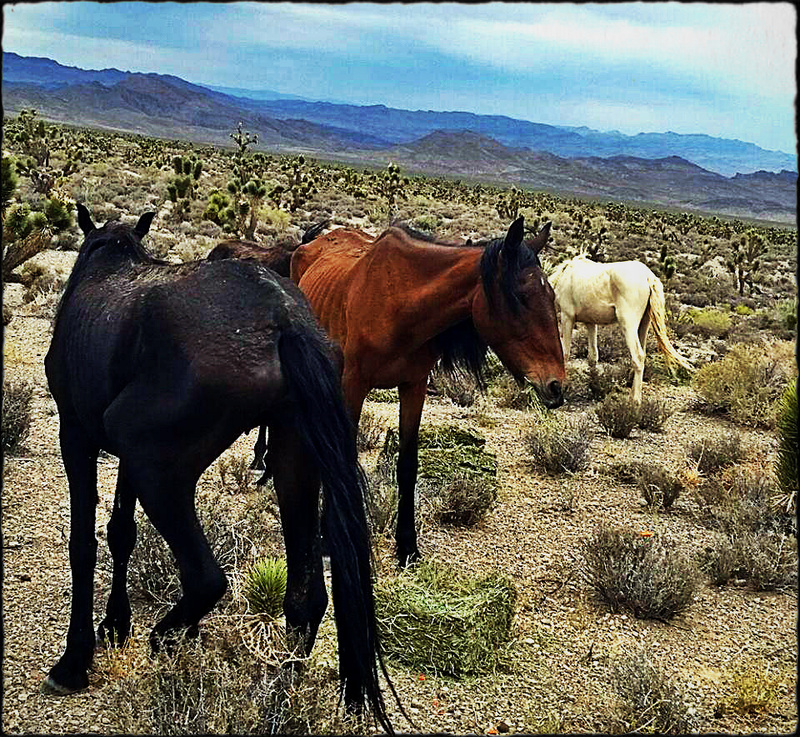 Some wild horse advocates have proposed that the starvation death of the horses is preferable to a round-up by the BLM, which they believe may be prompted by a Cold Creek resident’s letter that has been circulating about the condition of the horses. The volunteer-based America’s Wild Horse Advocates have suggested that the original letter writer was intent on creating drama in order that the horses would be removed from Cold Creek. If you read the letter, which is included here, you may agree that the writer of the letter seems hopeful that a roundup will not occur, because the horses are too weak to survive it, and suggests a coordinated effort to help the horses on the ground where they stand. Avoiding the involvement of the BLM seems to be a motivating factor in the decision by the AWHA to wait until fall to determine what, if any action should be taken, while continuing to negotiate for PZP darting. 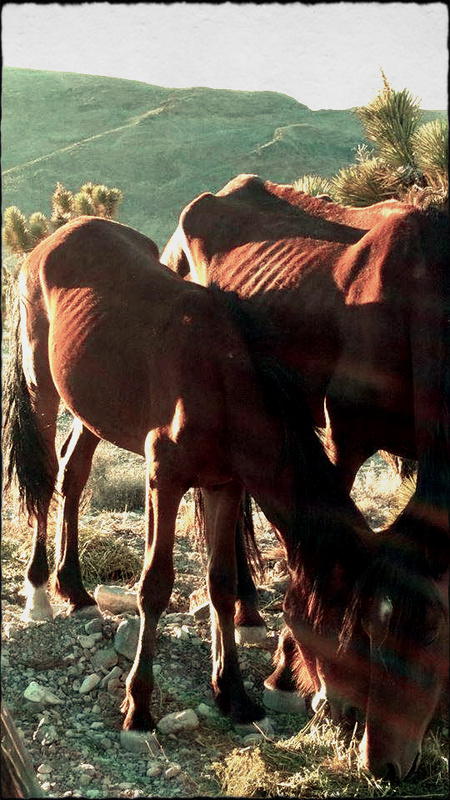 Emaciated mares with foals are being fed (at least at the time photos were taken), despite assertions that it is illegal to do so. Being fed by well-meaning people does mean that they will come down to the road for handouts, risking accidents with vehicles. Not only that, abrupt or inappropriate re-feeding can cause metabolic abnormalities leading multi-organ failure and death. These horses need more than “filling out,” let’s be honest. I have to admit I’m gobsmacked by the suggestion that the horses are not starving, but merely “thin.” A horse that has lost 50 percent of its body weight has a poor prognosis for survival. How will it be taken care of? If feeding is illegal, how will the situation be resolved? If they can be fed somehow in the fall, why not do it now, since they critically need it and before they decline even further? And it’s already too late for anyone to suggest that we should not interfere with nature, something we’ve done since the very 1st day when we started fencing horses off in pockets of land. We already hold interventions for wild animals – vaccination programs against diseases such as rabies or tuberculosis have been implemented for decades, and in national parks, starving animals are sometimes provided with additional food so that they may survive. Proposed growth suppression projects via PZP will all come too late for any horse who is a literal bone rack. It’s neither “natural selection” nor “survival of the fittest,” at least not from a biological perspective. Modern society interprets “survival of the fittest” to mean that only the strong survive. We often think of evolution in terms of a winner take all competition between the weak and the strong. The individuals that survive are not always the strongest, fastest, or smartest – the individuals who survive are those who have variations better suited to their environment and as a result, leave behind more offspring than individuals that are less well adapted. Natural selection is a process that generates or guides adaptations (traits) over evolutionary time. For a trait to be shaped by natural selection it must be genetic and heritable. Natural selection is a mechanism of evolution, and it is not about survival in the short term in a sample population of 250 animals, as longevity in the short term and adaptation over generational time (a really long period of time!) are not the same things. The effects of natural selection are barely perceptible, except over long periods of time, so the starvation of one generation of a herd of horses is not an example of natural selection. 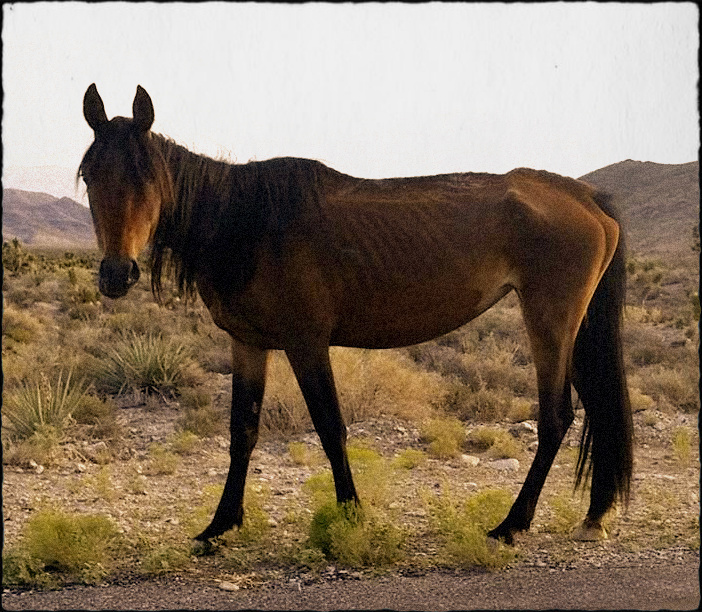 The majority of wild animals of any species die well before they reach maximum lifespan, but horses are at a greater disadvantage than many other species. I agree that the horses should not be gathered, and probably wouldn’t survive it anyway. When the horse is removed as through helicopter roundups, or is killed off by man, it leaves a big gap that upsets the equilibrated life-support system benefiting other wild populations. Wild horses are also a climax species, helping to sustain other ecosystems through the grazing of grass, pruning of vegetation, and consequent bolstering of annual plant productivity. Since wild horses are already being lost to roundups, slaughter, and most recently to fire, why not do more than stand around watching them starve? To sum up: there are three possible courses of action for these horses. Feeding – Is welfare better served by feeding rather than doing nothing? It is also justifiable if the horses won’t likely survive otherwise. If we believe that appropriate action should be option #3, then intervention should take place immediately before welfare declines even further. I don’t know what the solution is beyond a reasonable doubt. I don’t even know how it is legally or logistically workable. But I absolutely do not believe that starvation should be the preferred outcome here. What is really upsetting about this is that when it comes to an animal’s suffering it seems that supposedly intelligent and highly qualified individuals cannot use their logic and experience gained over the years to show compassion to a suffering animal. How many times do we tell pro-slaughters that starvation and slaughter are not the only two options? From an ethical standpoint, I believe that it is both appropriate and even necessary to intervene to help ensure that the wild horses retain their proper place in the landscape.